More stories will be added soon! I’m Joe Lose, from Minnetonka, Minnesota. I graduated from the NECC Broadcasting program in 2015. After starting in the broadcasting program in 2013, it only took me a month or two to get hired at 106 KIX/Lite Rock/WJAG. They used the same exact system as we had at KHWK, so there was little to no learning or getting used to period. Thanks to Brian Anderson and KHWK, I also knew how to handle production and countless other things a jock has to take care of. Not just “talking about music” and waiting for the next song. If that’s all you’re doing, you’re doing it wrong. Before graduation, I already had a job lined up in Columbia, Missouri. KCLR, Clear 99 has won multiple CMA and ACM awards for small-market country station of the year. All it took was two years at Northeast and a job shadow to get me an in with the station and now I have my own show along with a lot of spot production. I still use Adobe Audition every single day and while some other parts of the job are different than at KHWK, almost everything I learned easily transfers to different systems. Take your time at Northeast seriously. Make it your job. Those two years go quickly and you’ll need an aircheck to impress potential employers. Use your job shadows to go to a station you’d really like to work for. Just make it count and don’t make excuses. Good luck! I’m Trevor Huber and I was born and raised in Gayville, SD which is located near Yankton, SD. I graduated from Northeast in May of 2013. In August of 2013, I landed my first broadcasting job at KTIV News 4 in Sioux City, Iowa. I was a part-time Production Assistant for the 5, 6, & 10 O’clock newscast and my job consisted of running the audio board for live shows, lighting, studio preparation, running teleprompter, setting up cooking and interview segments, etc. While working at KTIV I was a proud member of a TV news crew that received an Upper Midwest Emmy Award for an evening newscast. I was the audio operator for the award winning coverage of “Argosy Casino Vs. The Hard Rock.” In June of 2014 I left KTIV & accepted a full time job at KCAU ABC9 News in Sioux City, Iowa where I was a full time Camera Operator/Production Assistant for the 5, 6, & 10 O’clock newscast. My job consisted of operating a camera for live shows, making graphics, editing news and weather teases, lighting, studio preparation, setting up sets for different shows, audio, etc. In 2017, I left KCAU to go back to KTIV, but this time to be a director. My education at Northeast helped me prepare for life in my career by having the state-of-the-art equipment, a weekly TV newscast, and allowing us to learn numerous jobs in the broadcasting industry. My words of advice to current and future broadcasting students is to take part in all of the duties the broadcasting department has to offer because not only will it add to your resume reel, but it will benefit you when it comes time to start your career. Lastly, being a part of broadcasting can be fun and rewarding when you see the final product go over-the-air. Just a few things that I’ve been a part of that are memorable to me are tornado/storm coverage, general breaking news, election coverage, and the legendary Kristie VerMulm signing off. Hopefully there will be many more to come! I’m Ryan Kumpf from Leigh, Nebraska. I graduated from Northeast Community College with a degree in broadcasting in 2012. After a few months of looking for a job out of college, I was hired by KFOR in Lincoln producing their Sunday Night gospel program from 7 to Midnight. I worked there for about 6 months before deciding to accept a part time sports play-by-play position at Three Eagles Radio in Columbus, Nebraska. That lasted for around 2 years before accepting a full-time position with the same station as Production Director. I have recently been moved to News Director and became the head of a new video streaming package the station has put together. You will also still catch me doing play-by-play for a variety of sports. Northeast taught me most of what I know in broadcasting today. The way you can go to school for 2 years and under $10,000 is fantastic, and the fact that you receive unlimited hands on training both with radio and TV is a huge plus. The biggest advice I can give is to strive to know everything. Don’t be afraid to volunteer for everything. I have done everything from cutting ads, announcing sports, hosting both a country and rock on-air shift, writing and recording news, and running video streaming equipment. Radio stations are looking for dependable people. Another thing you have to be able to do is be patient. I always viewed myself getting out of college and right away moving to Lincoln to work with the Husker Sports Network. But after 4.5 years, I have now been working full time in Columbus and loving every minute of it. Be patient and things will come. Broadcasting is a great business to get into if you have the drive and work ethic. I don’t remember the last time I have dreaded going to work since going full-time in radio. Hello! My name is Clint Leifeld, from Newman Grove, NE, and I graduated from Northeast Community College in 2011. Even before graduating the Broadcasting Program, I was offered an internship at US92 Radio in Norfolk. After graduation, I stayed with US92 until 2014, working my way up from intern, to working weekends on-air, then evenings, and eventually to being named Afternoon host. After Mike Flood, owner of US92, bought KBIE in Nebraska City, he offered me the afternoon position. I took the job and with the help of some great coworkers and a little hard work, we helped turn around a low budget radio station into the #1 Country Station in Southeast Nebraska. I served as the Production Director & Music Director at Today’s Best Country B103, and also did play-by-play and color commentary for high school football & baseball. In 2017, I made the move back to Norfolk where I am currently the morning show host for KNEN-FM. I am also doing some play-by-play and color commentary for their vast sports line-up. My time at Northeast Community College gave me the confidence & experience to make a smooth transition into life after college. The skills I learned from instructors who have real experience in the world of broadcasting and the chance to learn on state of the art equipment was very valuable. My advice to current and future broadcasting students is to take advantage of the opportunity to expand your skills on the air and behind the scenes while at NECC. If that means adding segments during your air shift, staying late to play around with the editing systems, or covering as many news or sporting events as you can, do it in college. Not only will that look great on a resume for future employers, but it will also make you more comfortable when transitioning into your future career. And most of all… have fun & never stop learning! My name is Jared Horak from Grand Island, NE. I finished the Northeast Community College broadcast department in 2007. My career took off after Northeast getting on as a intern with GI Family Radio in Grand Island in June of 2007. Three short months I found myself getting offered a full time position with in the company as six stations we’re purchased in Scottsbluff, NE. After seven years as operations manager in Scottsbluff I then got my opportunity to move home and now serve as a on air announcer for the seven stations in Grand Island that I originally started as a intern. My other duties include voice tracking out of market in McCook, play by play sports, writing station liners, and music director for two CHR stations. The education at Northeast Community College helped me prepare for what I like to call the “real broadcast world”. Having the hands on experience is second to none. The biggest thing I learned was a little bit of everything. Several times I find myself everyday voice tracking different formats, doing a news interview, programming music, or making a video of some kind for social media or a website. In my day to day duties I often think about, how did I ever learned how to do some of this stuff? Nine times out of ten, it always leads back to Northeast. My advice to anyone looking at going into broadcasting is learning a little bit of everything. Don’t get overwhelmed, it is a long list, but it can make you a great asset to a company in the industry that may want to hire you. If you love broadcast media, may it be tv or radio, one get your foot in the door. Two stick with it, and three; learn something everyday and never give up. I’m Dallas Nau from the tiny town of Winside, Nebraska. I graduated with a two year degree in Broadcasting from Northeast in 1987. After graduation I got my first job in Broadcasting at what was then KWMG-FM & KTTT-AM in Columbus, Nebraska. I worked a live shift that no longer exists In most radio stations around the country today, Overnights! Specifically 11pm-6am on the FM station. I later moved to Music Director/working nights and then afternoons along with becoming the Program Director of the FM station at age 24 and shortly afterwards the station’s Operations Manager. The company that I worked for then made me VP of Operations in charge of overseeing the OM’s at our other station’s In Nebraska, South Dakota and Minnesota. After six years in Columbus the company moved me to their stations in Lincoln where the corporate headquarters were located and I spent about four years in that market continuing my VP of Ops duties and also serving as Operations Manager and Program Director and an on-air personality for the two stations in Lincoln. The first chapter of my radio career ended after 10 years when the company I worked for, Radio One Broadcasting, was sold and I was let go by the new owners. That started the sales part of my career! I did not want to live the nomadic radio life of going from market to market for the rest of my career so I started a new chapter by working in Yellow Pages Sales. The training was fantastic but I really hated the job and it required a lot of travel. After less than a year and a half there (1998) I was excited to start my first broadcast sales job at KLKN-TV (ABC) in Lincoln. I worked there for about six years and learned a lot. I also found that my on-air experience writing scripts, producing them, knowing how promotions worked, etc. served me very well in my career in Sales. I left KLKN to work for KMTV-TV (CBS) in Omaha while driving back in forth from my home in Lincoln. In 2006 I started working for KHGI-TV/KFXL-TV of Kearney as a Senior Account Executive in their Lincoln Bureau/Sales Office. In 2007 I was promoted to Local Sales Manager and moved to Kearney. In 2009 I was promoted to General Sales Manager for their stations and stayed there in that capacity until February of 2014. On March first of 2014 (after spending about 18 years in TV) I started my current position as Market Manager back in radio where I started. I am ,now in charge of the five NRG Media Radio Stations in Kearney and Grand Island, Nebraska. We have two stations in Grand Island (KROR-FM & KSYZ-FM) and three in Kearney (KRNY-FM, KQKY-FM & KGFW-AM). Our stations are the market leaders in Central Nebraska with our FM stations ranked #1 thru #4 in most demographics and our AM station usually the #1 AM. We live the NRG Credo that is “Great Local Radio” or as it is now “Great Local Content” because our Digital content is becoming as important as what we do over the air. We have some GREAT people working for us that help us deliver on those promises every day. Today my family and I live in Kearney. Our son is attending UNL to study Mechanical Engineering and my wife is a nurse. My education at Northeast gave me the basics I needed to start in the Broadcasting business. It also exposed me to both Radio and TV production, etc. so I could help figure out my path. Obviously all of that came in really handy later in my career as well. Northeast Broadcasting was a great base on which to build on. Because that is what you are doing is building a career and everything you build needs a foundation to build up from. As far as words of advice to current and future Northeast Broadcasting students…Embrace Change! Embrace the fact that you may not do for a career what you start out doing. Experience as much of the industry as you can and it will serve you well later on. I set out to be a “Morning Show Host” but found that was not where my strengths are. I will also say that in hindsight now although most all Broadcasting students don’t look at Sales/Management as their goal when they start out it is a higher paying part of the industry that will never be phased out by computers. You should take a look at the opportunities that are available in that area as another way to participate in this crazy business. I have been very fortunate to work for some great bosses/mentors at several of my career stops (Wayne Walker and Roger Dodson at Radio One, Roger Moody at KLKN-TV, Vince Barresi at KHGI/KFXL-TV and now Chuck DuCoty at NRG) and I always try to soak up as much as I can about every aspect of the business…Sales, Programming, Engineering, Promotions and now our on-line content with our station web-sites and social media feeds. Cultivate your own mentors and NEVER stop learning everything you can or you will get left behind. My name is Jeremy Anderson from Walthill, NE. When I left NECC, I took a job as Sports Director at KTCH in Wayne, NE. My broadcasting career has given me the opportunity to see many places, and meet many great faces, including interviewing some of the top sports and political figures in our state and across the country. It opened up opportunities for me to grow as a person, and put me in places that I could have never imagined prior to attending Northeast. I’ve made stops not only in Wayne, but Scottsbluff, NE; Fairbury, NE; Newcastle, Wyoming, with each community and each radio station offering its own benefits to put towards what I am doing now. For the past several years, I have called Chadron, Nebraska my home, working with Chadrad Communications (AM 610 KCSR/FM 107.7 KBPY). I began as the News Director in 2012, before being shifted to the Production Director role and On-Air staff. Now I am the Sports Director and Operations Manager fulfilling all of the play-by-play duties for football, volleyball, and basketball as well as hosting shows on both our AM and FM stations. I am also the first line of hiring at Chadrad Communications. 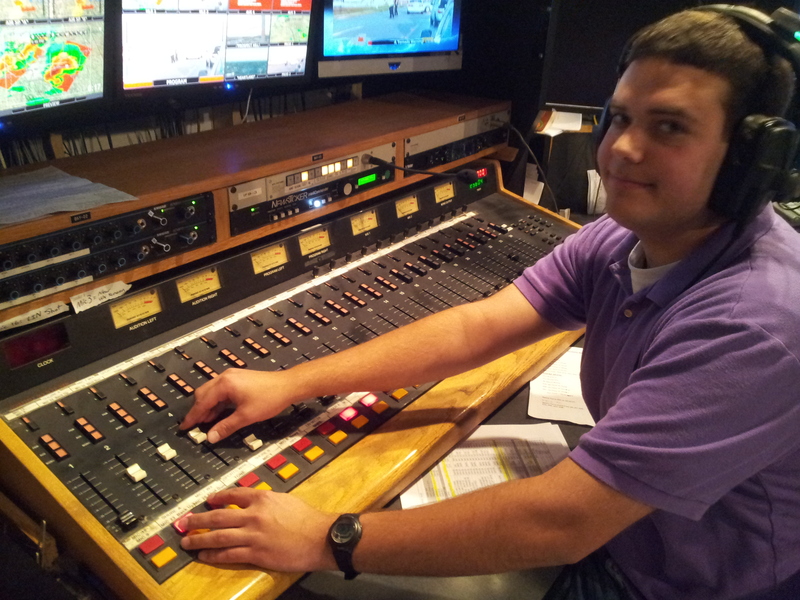 I couldn’t have found my way in the business without the start I was given in the broadcasting department at NECC. With the latest technology in radio broadcasting, I was entering the profession on the same level as several of those who had already made footprints in the industry. I was prepared to step up to the plate and use my skills to enhance the broadcast of any station that I may occupy. From air shifts, to play by play, and conducting the daily operations of a full service radio station that Northeast has to offer, there were no areas of the business that were too great to handle. If I had to shed any bit of advice for those that are hoping to break in to the industry, it’s simple! Relationships! Build them, love them, take care of them. The people you meet along the way, from your fellow broadcasters at Northeast, to those you meet along the career path, are always going to play one of the biggest factors on where you land a job, how you perform at that job, and how long you get to, or choose to, stay at that job. The stronger those relationships can be, the easier you are going to find your job will be, and will, in return, allow you to do more with the opportunities in front of you. Never expect anything from anyone, just because you “think” you deserve it, or are qualified. Do the little things that make you stand out from everyone else. Don’t shy away from giving it the extra effort. Don’t settle for mediocre! Whether you are at the same company for 50 years or 5 months, there is always something you can do as an individual, every day, that will make the job you have, feel brand new, and give you the same excitement that you had on day one. Copyright © 2019 The Official Radio and TV Station of Northeast Community College.